There followed a conflagration in which one heroic watchman lost his life, which 2,200 firemen, using five-sixths of the city’s apparatus, until the next day to subdue and which destroyed a dozen famous stockyards structures and fifty minor buildings The fire was the most widespread since the great conflagration of 1871, with property damage now placed by underwriters in the neighborhood of $4,500,000. But as an agent of destruction that careless motorist who tossed away his cigaret was a piker compared with that group of public employes—quite efficient employes, in the main—who in the county building prepare and send out Cook county’s 1,100,000 annual real estate tax bills. Theirs is a smokeless, unspectacular destruction, but it numbers each year hundreds of buildings as its toll against the few score which burned at She stockyards. This devastating effect of taxes tearing down a city—because the owners of buildings find it cheaper to wreck them than to operate and pay taxes on them—is evidenced by the pockmarks of scores of parking lots which have replaced office and warehouse structures in the loop and surrounding business districts. It appears again in apartment houses throughout the city, owners of which, unable to operate at a profit, have boarded up or abandoned theme to vandals. The slow fire of tax destruction strikes indiscriminately. In the list of casualties appear the home of a merchant prince of earlier Chicago, where President Grover Clevelaind was entertained. and, farther down, what was once America’s most elegant and notorious bawdy house. It is rapidly operating to complete the work of the great fire of’ 71 in stripping Chicago of its historic landmarks. A century-old tavern where fur traders and Indians begged has given way to a parking lot, as has a great wholesale building which in its day was one of the city s most famous business structures. A cottage where Abraham Lincoln often slept when he came to Chicago to try law cases has been pulled down, and a great brewery, which even the return of beer could not rescue from its tax burden. 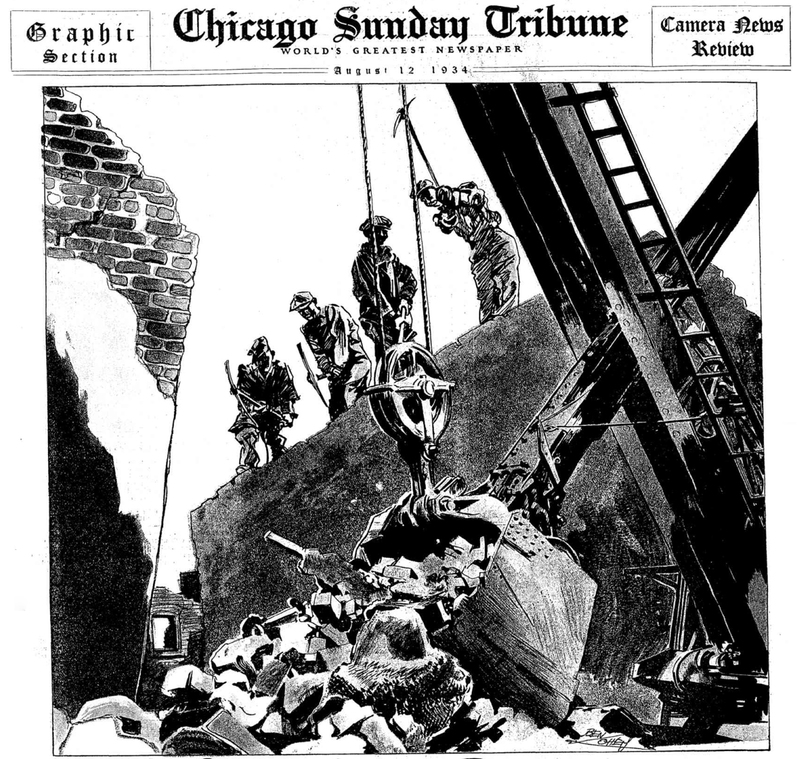 Since 1931 Chicago has torn down more than twice as many buildings as it has built. 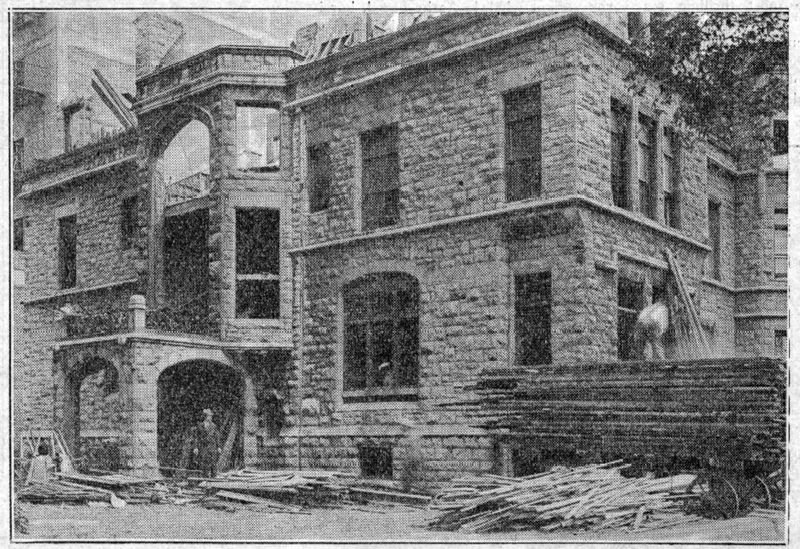 Records of the city building department show that during 1932 and 1933 the buildings torn down, including those condemned by the city as unsafe, totaled 1,948. During the same two years permits to erect new buildings totaled only 928. Furthermore, only a few of the new structures went up on the land cleared by wrecking. During 1929; the last year of the building boom, 6,146 permits were issued for the erection of buildings with a total cost of $202,286,800. That year only 1,017 buildings were wrecked, less than in 1933, when the city saw only $3,683,960 in new building construction. Each year, in making up the real estate assessment roll, the staf of Assessor J. L. Jacobs makes a survey ot all buildings wrecked or destroyed during the previous year. Those records for 1930, 1931, and 1932 are available (the 1933 assessment is not finished). They show that after excluding as worthless from a taxation standpoint all structures ordered wrecked by the city as unsafe, a total of 1,362 taxable buildings were torn down in the three years. The exact total of these losses in taxable property is not available. Members of the assessor’s staf estimated it, however, taking as a basis of value 20 per cent of the reproduction cost of the buildings. This is the maximum depreciation allowed for age and condition of buildings. On this basis the estimate totaled $4,826,345. Even after deducting 20 per cent for buildings destroyed by fire, a high percentage, because most burned buildings are repaired or rebuilt out of insurance and do not disappear from the tax rolls, the loss of taxable property in three years was $3,861,076. Records for 1934 have not been compiled, but wrecking is continuing at a faster pace, if anything, than it did last year, building authorities say. A significant feature of the 1933 figures was that of the 1,046 buildings pulled down, 514, or nearly half, were in the high-rent, highly taxed central business district bounded by Chicago avenue, Halsted street, 26th street, and Lake Michigan. In the downtown business district the last count showed 32 parking lots in the area bounded by the Chicago river, Harrison street, and Michigan avenue. All but one or two of the sites were occupied by buildings a few years ago, and, except for a few rendered useless by the construction of Wacker drive, the majority were tenable, though unprofitable because of their tax load and operating costs, when the wreckers took charge. A swing around the belt immediately outside the loop area, occupied except on the near north side principally by slums and, factories, will disclose a still greater destruction of buildings. Chicago avenue just east of the north branch of the river, and the industrial-wholesale district south of it, show dozens of vacant areas in which the rubble of wrecked buildings is usually discernible. The same condition applies on the near west side. There are several blocks just east of Ashland avenue near Fulton street where the area of recently destroyed buildings surpasses that of those left standing. 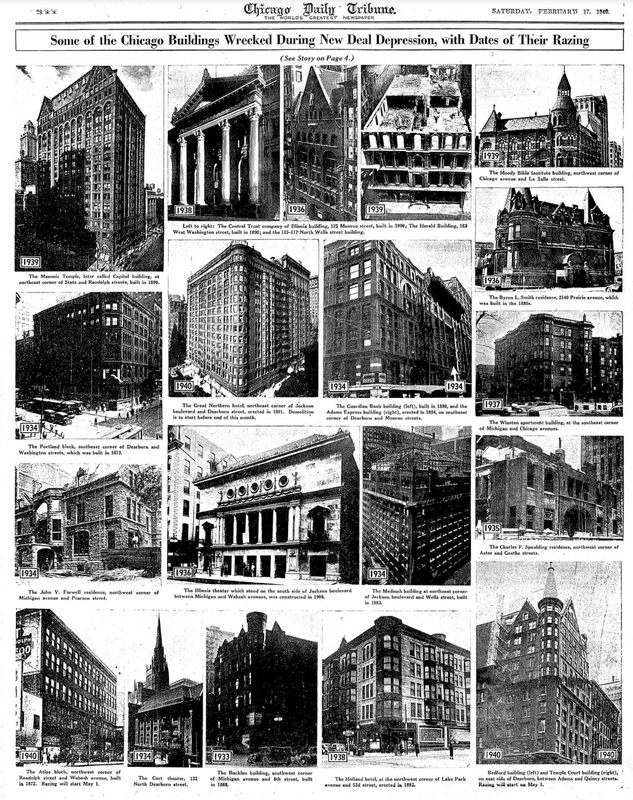 Along Washington and Jackson boulevards, despite the heavy flow of trafic to and from the loop, billboards screen a dozen locations where owners found it profitable to pull down buildings. In that approximate half mile square bounded by Halsted and Canal streets, Harrison street and Roosevelt road, where the great fire of 1871 had its first sweep, it appears today as if another holocaust had swept through. In that area whole blocks have been cleared of buildings, and in others solitary flat buildings stand alone. Here, however, the extreme age of the buildings, most of them put up after the great fire swept the area and occupied for decades as slum dwellings, has been a more important factor in wrecking than in other districts. Continuing the swing back toward the lake, inspection shows the wreckers likewise have been active in what was once Chicago’s Gold Coast—along Michigan, Prairie, and Calumet avenues from 18th street for half a mile south. The fine home in which Gen. John A. Logan lived, on Calumet avenue near Cullerton street, still stands, occupied by a restaurant, but its neighbors on each side have given way to parking lots. Near by, the former home of George M. Pullman, at Prairie avenue and l8th street, wrecked within recent years as a means of saving taxes, say real estate men in the district. Among real estate brokers and building managers there are two schools of thought regarding the exact role that taxes play in this wholesale destruction of property. One group holds that high taxes are not the principal factor, but rather that the determining cause is the ravages of old age upon buildings which, though sound physically and safe for occupancy, but because of low rentals, high expenses of operation, and costly fire insurance, cannot be maintained at a profit, regardless of the taxes levied. But to this argument, that, obsolescence is the principal cause of building demolition other experienced real estate managers reply that it would not be so if tax assessing officials made proper allowances for economic old age of buildings as distinguished from their physical old age. Assessments are made in Cook county upon the basis of cost of reproduction with new materials. From such an appraisal deductions are allowed for physical old age, in rare cases as high as 80 per cent of the duction cost. But slight if any regard is given to the economic old age of buildings still in relatively good physical condition. Old stone mansion built by the late John V. Farwell, northwest corner of North Michigan avenue and Pearson street. Wreckers have pulled down the building, and now the most profitable use which can be found for the land is as the site of a row of billboards. Many four to six story buildings in the downtown area were built for use of their first floors by retail stores and their upper floors as lofts for light manufacturing or jobbing concerns. The light and jobbers who formerly rented these quarters have moved to less central locations or gone out of business in many cases, and there no longer is a demand for such upper floor space. The owner of such a building finds himself in the position of trying to earn a profit out of the rents for his first floor, or possibly the first two floors, alone, while he still is taxed for several useless upper stories. He can save both taxes and operating expenses by cutting his building off at the first or second story level, and often, in an old building, he is better off to raze the entire structure, renting the land, if possible, for a parking lot. An alternative remedy to the parking lot, applicable only in locations where rents are high for level store space, is the one or two story “taxpayer” building, so. called because its purpose is to earn enough to amortize its own cost within a few years and pay taxes on the land beneath until more profitable use can be found for its site. One of the more successful of these taxpayer buildings was described by Leo G. Varty, whose management firm handles the building at the southeast corner of Washington and Dearborn streets which replaced the old Portland block. Richard W. Sears, one ot the founders of Sears, Roebuck & Co., bought the building for $1,000,000 in 1909. His widow, Mrs. Anna L. Sears, owned it and owns the “taxpayer” which succeeded it. Although the original building was erected in 1873, the building assessment was still $169,000, full value, for 1930. It was a fair money-maker right up to the start of the depression, despite its age. In the year ending May 1, 1928, it earned $121,200, which left $49,883 profit on the investment after paying $34,712 in operating expenses and $36,883 in taxes. But in the year ending May 1, 1933, earnings were only $60,290. Operating expenses had been cut to $22,855, but taxes had risen to $42,239, leaving Mrs. Sears to pay $4,804 out of her own purse for the privilege of operating the building. After considerable investigation of the subject, she ordered it wrecked and replaced with a modern two-story shop and office building. All of the space is rented for the current year at minimum rentals of $66,650. Taxes on the new structure, which cost $88,388, should not exceed $32,500 for both land and building, Mr. Varty estimated, and operation costs, mostly for heat, are but $7,000 annually, less than a third of the figure achieved in the old Portland block by the strictest economy. The net income will be sufficient to amortize the cost of the building within ten years, much less than its physical life period, and to give a modest return on the land. Mrs. Sears is so well satisfied with the experiment that she has had the old Union Bank building, which stood next door to the Portland block on Dearborn street, wrecked, to be replaced by another “taxpayer” structure. Estates owning a number of other old loop buildings are taking similar action. The “taxpayer” building can only be successful, Mr. Varty said, in a good retail sales area where there is a demand for first floor store space at substantial rentals. A parking lot, he contends, depreciates the rental value of adjoining property, and in so doing depreciates its own value. The biggest parking lot in the area is on the space formerly occupied by the Marshall Field & Co. wholesale house in Adams street, extending from Wells to Franklin street. Designed by H. H. Richardson, a world-famous architect, and built of great granite slabs, it was an outstanding business structure and, in spite of its forty years, .was still in sound condition when the Field wholesale business moved from it to the Merchandise Mart. The building, however, suffered from economic obsolescence. George Richardson, manager of the Marshall Field estate, owners of the structure, said that its high ceilings made it difficult to remodel for modern use, and its size made it impossible to find a tenant to use it as it was. Nevertheless. the 1930 taxes were $33,400 on the virtually useless building and $77,495 on the land. After wrecking, the rental as a parking lot is now approximately equal to the tax bill, although this was not true for the first two years of operation. A more profitable parking lease, on a much smaller space. was negotiated by Baird .& Warner for a 65-year-old four-story loft building at Clinton and Monroe streets. Wrecking the building saved $2,242 on a $6,450 tax bill, and the parking rent is sufficient to meet the remainder of the bill and leave the owners about $1,000 income annually. Baird & Warner also were agents for a building which has brought home to tax-spending officials perhaps more closely than any other the action of overburdening taxes in destroying buildings and revenue sources. The building, a five-story structure at 110-14 North La Salle street, almost directly across the street from the front door of the city hall, was wrecked in recent weeks and replaced by a parking lot. For many years the Virginia hotel, at Rush and Ohio streets, was one of the city’s finest residential hotels. Dwindling revenues and mounting taxes caused the owners to order it wrecked and replaced by a parking lot. By wrecking they saved an annual tax bill of $6,000 on the building, insurance costs which were estimated at $3,000 more, and a further loss in operating expenses, it is understood. Dwindling and mounting taxes caused the owners to order it (Virginia hotel) wrecked and replaced by a parking lot. Not far away, at Michigan avenue and Pearson street, stood the old stone mansion built by the late John V. Farweli. Thirteen-years ago it was bought by an insurance company, now defunct, which announced that it was to be part of the site of a skyscraper. The skyscraper never was built, wreckers have pulled down the building, and now the most profitable use which can be found for the land is as the site of a row of billboards. Tax bills do not confine their destructive efforts to the high-valued land in the downtown area. Out in Evanston, Theodore C. Keller, president of the Illinois and Indiana Coal corporation, had built a twenty-room mansion at Greenwood boulevard and Maple avenue. A year ago his widow had the mansion destroyed and by so doing saved the major part of a $1,500 annual tax bill. For years the old Dunham mansion (right) nestled against the Congress hotel in South Michigan avenue. The founder of the family fortune had restrained his daughters from disposing of any of the real estate which he owned for a long period of years after his death. When the prohibition was lifted the mansion was wrecked to make way for a parking lot. Two blocks farther south on Michigan avenue the Bucklen apartments were one of the show places of the city for many years after their erection in the nineties. They were built by H. E. Bucklen, a druggist who made a fortune with a cough sirup. They have bowed to high taxes, and a parking lot, along with the Bucklen residence next door, which contained a fortune in rare woods, and Michael (Hinky Dink) Kenna, boss of the First ward, has had to find a new home after being one of their tenants for 34 years. The old Everleigh club at 2131 South Dearborn street, probably the most notorious resort on the continent, flourished from the nineties until 1911, when Mayor Harrison ordered it closed. On July 24, 1933, tax bills dealt the finishing stroke, and wreckers began removing expensive mirrors and fireplaces from the building. A historic landmark bowed to the pressure of taxes a month later. This was an ancient building at 344 West Kinzie street. Archibald Caldwell and James Kinzie built it, according to tradition, as the Wolf Point tavern in 1830. Sailors and fishermen formed a bucket brigade to save it during the great fire. Henry Gries, who had been superintendent of construction at the Columbian Exposition, operated a saloon in it from 1893 until the coming of prohibition. It was for parking purposes. Abraham Lincoln, coming to Chicago to try cases as counsel for the Illinois Central railroad in that period when he had lost faith in his future in politics and was building a practice as a corporation lawyer, frequently stayed with relatives in a cottage at 127 South Morgan street. A year ago the cottage and adjoining structures were torn down because of taxes and the land offered for rent as a parking station. Another famous structure which yielded to a parking lot was the Tremont hotel at Lake and Dearborn streets. Built after the great fire, it sup- planted an earlier hotel of the same name from the balcony of which Lincoln and Stephen A. Douglas had spoken. Even the return of beer could not save from the wreckers the old Conrad Seipp brewery at 27th street and the Illinois Central tracks. Built in 1871, the plant could not have been reproduced for $5,000,000, experts said. It had a pre-Volstead capacity of 750,000 barrels of beer a year. The company went bankrupt after prohibition, and the machinery was sold later. The bondholders who controled the property decided to wreck the buildings, covering four acres, to save taxes. Another famous structure which yielded to a parking lot was the Tremont hotel (above) at Lake and Dearborn streets. Built after the great fire, it supplanted an earlier hotel of the same name from the balcony of which Lincoln and Stephen A. Douglas had spoken. Taxes were only indirectly responsible for what has been pronounced the largest building demolition job in the world, that of the Deering works of the International Harvester company on the north branch of the Chicago river between Diversey and Fullerton avenues. The plant, covering 79 acres originally, and once the second largest farm machinery establishment in the country, has been abandoned. Taxes enter the picture in two ways, first in the failure of tax officials to recognize the economic obsolescence of the group as separate from its physical deterioration, and second in the opportunity to carry on the same business at East Moline on ground paying much lower taxes than those demanded in Chicago. The principal cause of the property destruction, officials of the Harvester company said, was inability to use the old four and five story buildings for their modern heavy manufacturing operations. The plant was built, starting in 1879, in the days of small horse-drawn farm machinery, which has been supplanted by harvester-threshers, huge machines almost as large as a small bungalow. These mechanical giants have to be built in a single-floor, “straight-line” plant similar to those of the automobile industry, and it is to such a plant at East Moline, where lower taxes and proximity to Mississippi barge trafic are an added attraction, that the company has its operations. The Globe Wrecking company already is carrying out a contract to tear 13 acres of at the Deering plant, and more probably will be demolished to save taxes if they cannot be rented for light manufacturing purposes. Another large manufacturing plant to give way to a parking lot in the hope of getting enough revenue to pay land taxes was the old Kirk soap factory in Michigan avenue north of the link bridge. A typical case of the destructive work of taxes even after owners had cut operating costs of an old and unprofitable building to a minimum was that of the Medinah building at Jackson boulevard and Wells street. Fourteen stories high, it was once a highly profitable office structure. High operating costs caused the owners a year ago to move the tenants out of the twelve upper stories, leaving the first and second floors. as a theoretical taxpayer. They found, however, that this gained them no reduction in taxes on the useless part of the building, and now they have torn the building to two stories, leaving the steel framework of the lower floors as the skeleton of a modern two-story office and store building. Rentals from this, they expect, will meet tax bills and pay a small return on the investment. 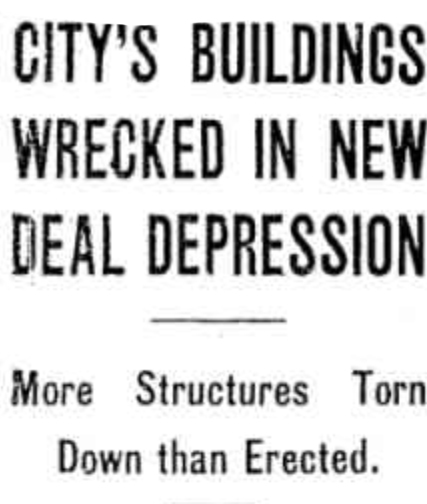 For seven years—the duration of the New Deal depression—more buildings, both business and residential, have been torn down in Chicago than have been erected. Since 1933 laborers with pickets rather than the wielders of the trowel, hammer and saw have got the money. Along with the Roosevelt hard times, ever mounting taxes and obsolescence have been contributing factors. Millions of dollars worth of buildings in downtown Chicago have disappeared at the hands of the wrecking crews and thousands of residential units, both single family dwellings and flat buildings, have been torn down. Towering loop structures, once world famous and supposedly good for many more years, have been razed. One and two story “taxpayers” or open air parking lots have taken their places. The Masonic Temple, built in 1890 and Portland Block, built in 1873. Recently the Marshall Field estate announced that it would tear down the famous Great Northern Hotel—at one time the central west’s leading hostelry. It was built in 1891. A one story “taxpayer” is to be erected on the site at the northeast corner of Jackson Boulevard and Dearborn Street. The Medinah building, at Jackson Boulevard and Wells Street, was built in 1893 and for years was one of the show structure of downtown Chicago. It was demolished in 1934 while it was in its structural middle age. 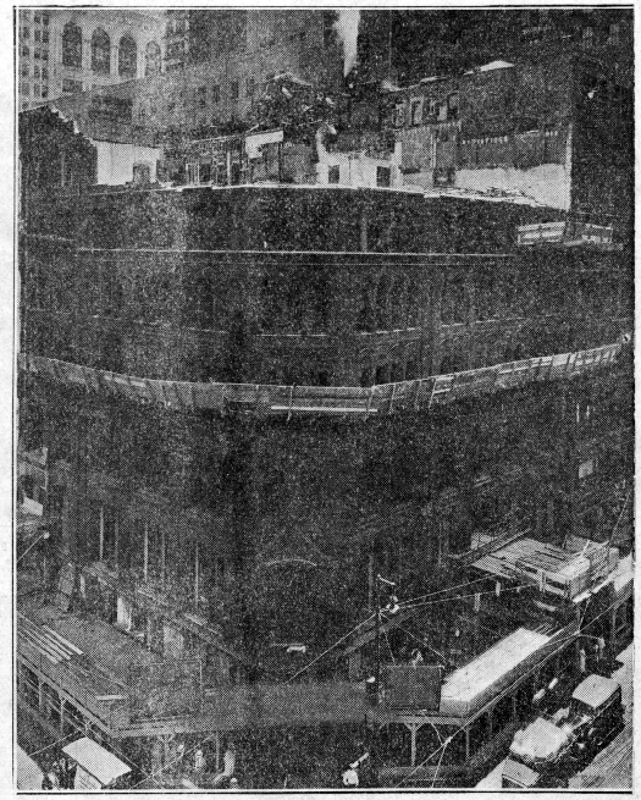 The Guardian Bank building in 1880 at the southeast corner of Dearborn and Monroe streets, went to the wreckers in 1934 also. A two story “taxpayer” replaced it. 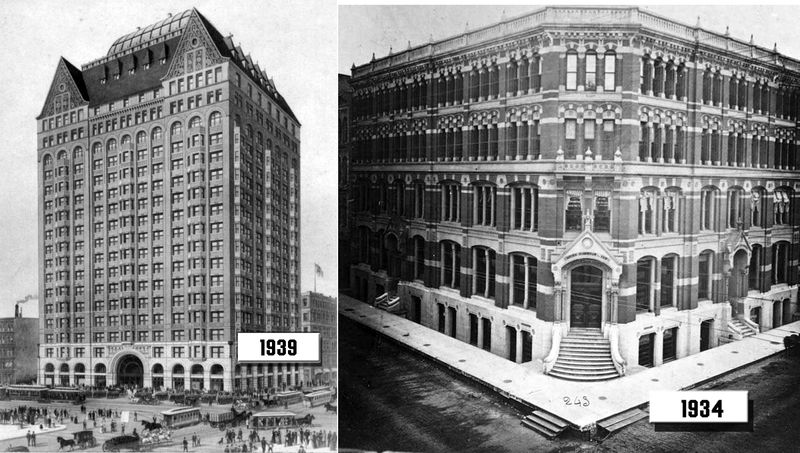 The 11 story Adams Express building, built in 1884 and adjoining it on the south, was razed at the same time. An alternative remedy to the parking lot, applicable only in locations where rents are high for street level store space, is the one or two story taxpayer building. Illinois theater building, 63 East Jackson boulevard, built in 1900 and then considered America’s finest playhouse. The site is now used for parking. The Central Trust Company of Illinois building, 125 West Monroe street, built in 1900, and an outstanding bank building for many years. Union Bank building, 25 North Dearborn street, built in 1880 and supplanted by “taxpayer” in 1934. 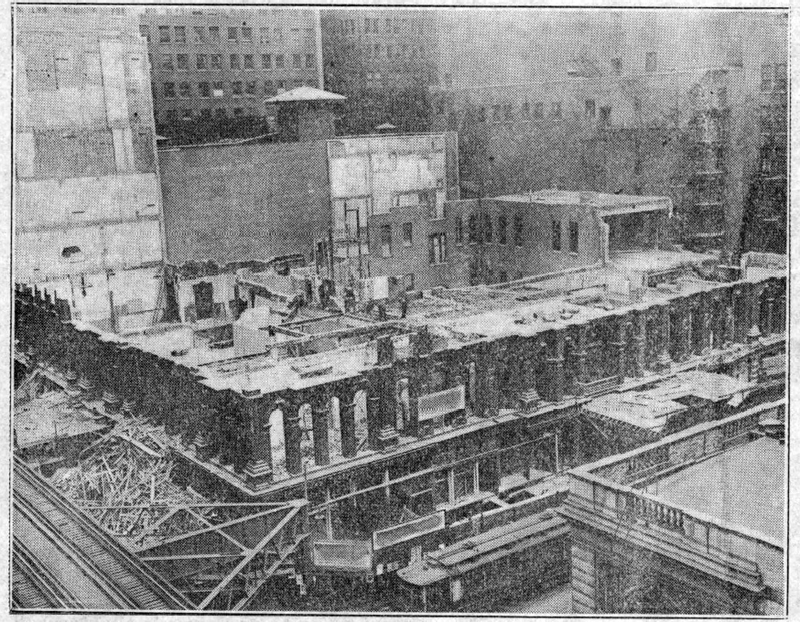 The Gerald building, 163 West Washington street, torn down in 1936 and space used as parking lot. Ceylon building, northwest corner of Lake street and Wabash avenue. 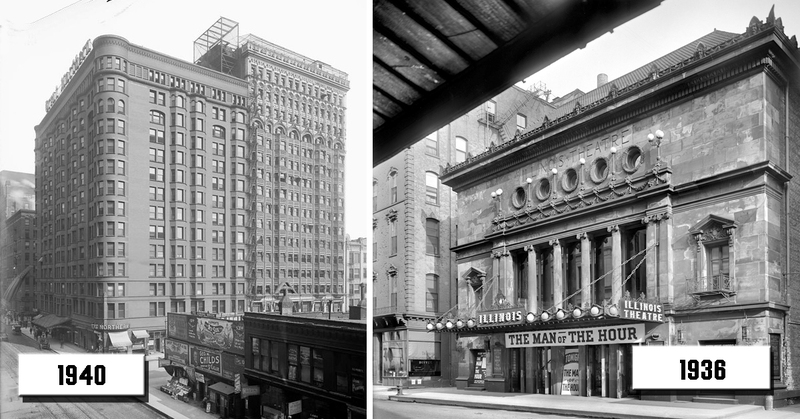 Cort Theater building, 132 North Dearborn street, razed in 1934 and space used for parking. Commercial building, northwest corner of Lake and Dearborn streets, roen down and space used for parking. American Commerce building, southwest corner of Wabash avenue and Adams street, torn down in 1937 and replaced by a two story “taxpayer.” A third story was added recently. The former Chicago Evening Post building, 20 South Market street, wrecked in 1935. 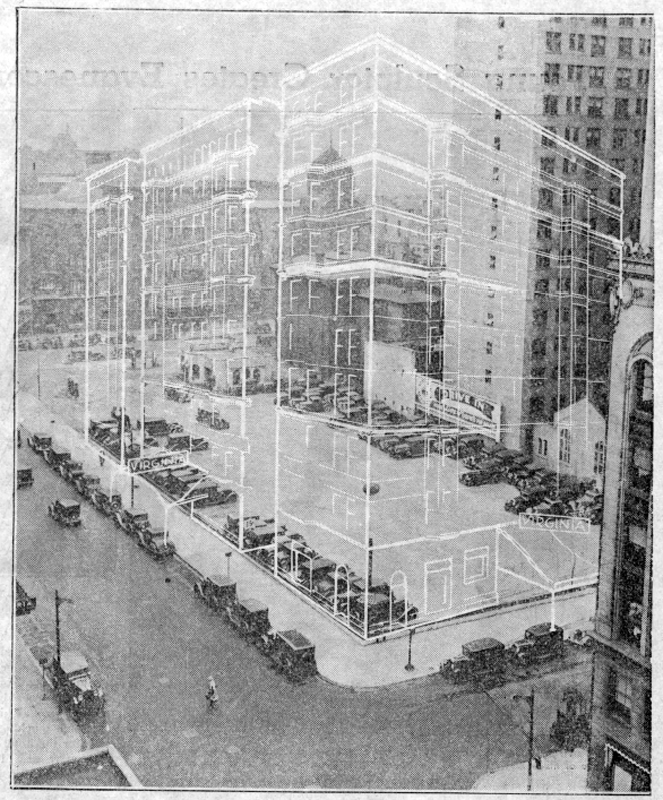 The Albert Pick building at 208-12 West Randolph street, torn down in 1934 and space used for parking. Barnhart building, 25-31 North Wells street, wrecked for parking. 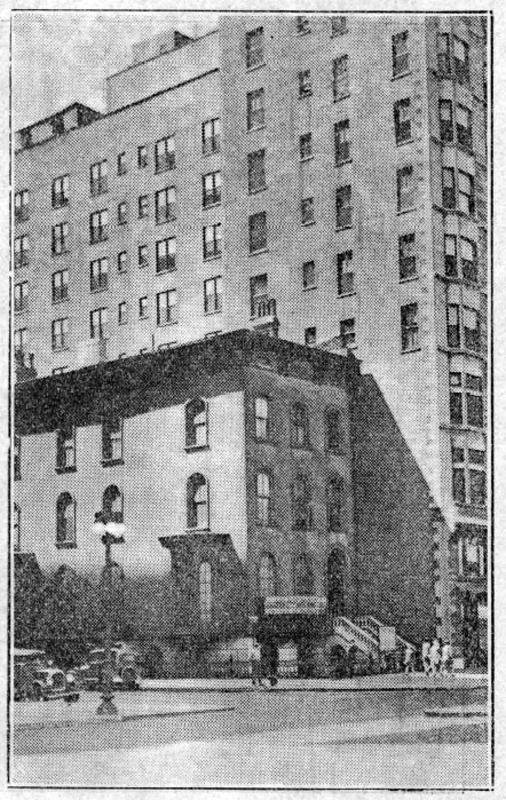 Five story building, southeast corner of Madison and Franklin streets, wrecked in 1934 and space used for parking. The Great Northern Hotel, built in 1891 and the Illinois Theater, built in 1900. Eight and six story buildings, 618-34 Sherman street, once owned by the late James A. Patten, wheat king, torn down last year. Five story building at 329 South Wabash avenue. Six story building at 4-6 North Franklin street. Five story building at 308-10 West Madison street. Eight story building at 118 North La Salle street. Five story building at the southwest corner of Randolph and Franklin streets. Seven story building at 115-17 North Wells street. Six story building at 364-76 West Monroe street. Six story building at 430 South Wabash street. Six story building at the northwest corner of Jackson and Clinton streets. Three buildings at 178-86 North Clark street. North Side Turner hall, 820 North Clark street. Holland hotel. built in 1892 at the northwest corner of Lake Park avenue and 53d street. Winston apartment building, southwest corner of Michigan and Chicago avenues. Five story furniture warehouse at the northeast corner of Grand avenue and St. Clair street. Four story building, northwest corner of Clark street and Wrightwood avenue. John V. Farwell residence, northwest corner of Michigan avenue and Pearson street. Byron L. Smith bouse, 2140 Prairie avenue, which was built in the 1880’s. Joseph Medill home at the northwest corner of Ontario street and Wabash avenue. Mr. Medill was editor of The Tribune for 44 years. Charles F. Spaulding house, at the northwest corner of Astor and Goethe streets. A. J. Kasper house, 628 Deming place. Former Eugene Field residence, 738 Diversey parkway. D. F. Scully house, southeast corner of Dearborn and Washington streets, have received notice to move. The owner has not yet decided on how the site will be used. Outside the loop area soaring taxes and depreciation also have been responsible for the tremendous demolition campaign against property waged by discouraged owners. When will it stop? No one knows. Actual page from the February 17, 1940 Chicago Tribune article.